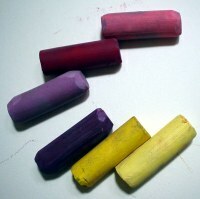 Making pastels is a great way to create unique colors that you can't get from standard brands, and if you do not mind the process being messy, making your own pastels is actually pretty simple. There are some good reasons for making pastels yourself. For one thing, you can control the softness or hardness of the sticks. Most of the pastel sticks on the market are hard or semi-hard. I love the buttery feel of extremely soft pastels. So wouldn't it be great to make your own and save some money? Another good reason for creating home made pastels is that the colors are often brighter and richer than the pastels from art supply stores. 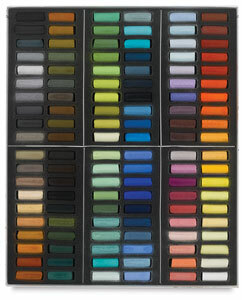 And on top of that, once you know how to do it, you will have precise control over the consistency and color of your pastels. And don't forget a lot of paper towels! The fun begins with color mixing. Make the binding solution. Mix about 4 tablespoons of gum tragacanth and ½ teaspoon of beta naphthol with 2 pints of distilled water. Let it sit in a warm place overnight. You can make a large amount of binding solution in a big mixing bowl and then store the excess in tightly sealed jars. 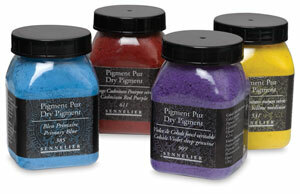 Use more distilled water in the binding solution to make softer pastels and less for making harder pastels. Pour the dry pigments onto the glass surface and add binding solution (not too much). Mix thoroughly with a painting knife until no streaks of color show. To make the color lighter, mix the binding solution with chalk to make a white paste first. Then mix an equal amount of pastel paste and the solution together. To make the color darker, the procedure is the same as above, but use ivory black pigment instead of chalk. When the pastel is thoroughly mixed, you're ready to roll! Knead the pastel on a glass covered in paper towels to reduce excessive moisture. Pinch a lump of paste and roll it into sticks, or make a long stick and then cut it into small sticks. Roll it by laying your forefinger along the length of the stick. If you want your sticks to be smoother, roll the paste with a piece of cardboard covered with paper towel. Allow the pastel sticks to dry for two days, and they are ready to use.